Thinking I need that dress in my life...so cute! I feel like I'm in a constant obsessive love affair with Kate Spade. That bow dress is perfection! I seriously have so much love for Kate Spade. I have a few jewelry pieces and home items and they are among my favorite possessions! Ugh. I am right there with you, Kristina. It's difficult to resist the urge to drop an entire paycheck on Kate Spade! Aaah so addicting. I love those pastel pyramid studs! Oh I would love all of those items. That dress and the polka dot shoes are gorgeous. I always want everything they put out- I wish it was cheaper. Love that dress and those studs! Have the square studs in Green. I love them so much. Love everything Kate Spade does! So fantastic. I just found your blog today! I'll definitely be following! 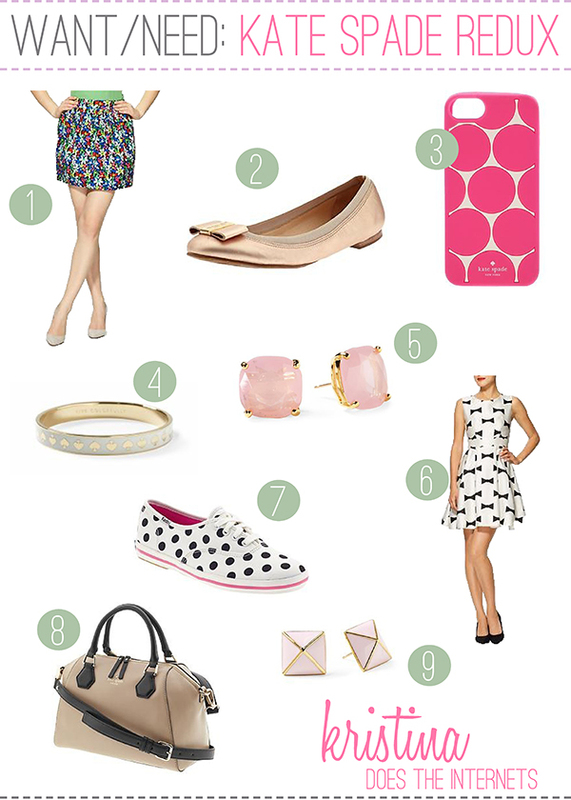 I love all your Kate Spade picks - especially those flats!! I know, the price is the main problem. Doesn't mean I can't dream! A whole paycheck may not be the wisest thing to do, but being wise isn't fun! I basically want everything they make. I know, I wish it would get into my closet now!